January 28th is traditionally the day of the “Second Feast of St Agnes”, although this very ancient observance was reduced to a commemoration in 1931, and abolished in the post-Conciliar reform. It is still kept in some churches dedicated to St Agnes, most prominent among them, the basilica built over the site of her burial, less than a mile and a half from the gates of Rome. In liturgical books, the formal name of the feast is “Sanctae Agnetis secundo”, which literally means “(the feast) of St Agnes for the second time.” This title is found on the calendar of the Tridentine Missal and Breviary, as also seven centuries earlier in the Gregorian Sacramentary. The single Matins lesson in the Breviary of St Pius V tells us that after her death, Agnes appeared first to her parents to console them, and then to the Emperor Constantine’s daughter Constantia, who suffered from an incurable sore, while she was praying at her grave, exhorting Constantia to trust in Christ and receive baptism. 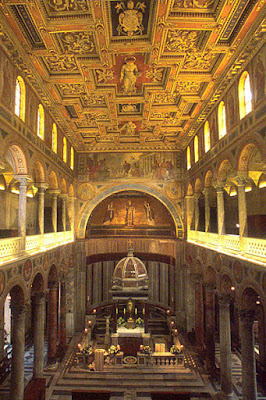 Having done this and been healed, Constantia later built a basilica in the Saint’s honor. The prayers of the Gelasian Sacramentary, which dates to the mid-8th century, and uses titles for the two feasts similar to those in the Wurzburg lectionary, may refer to the idea that St Agnes’ passion began on the 21st, and her death occurred on the 28th. One of the two collects for the former refers to the day “of her passion”, and asks that “we may follow the constancy of her faith,” while the Secret of the latter says that “she was glorious from the beginning of her blessed contest unto the end.” On the other hand, the Collect that goes with it says that we are “repeating” her feast, while the Secret on the 21st speaks of her “heavenly victory”, certainly a more appropriate expression for the actual day of death. In short, the earliest evidence in inconclusive. A leaf of the Gellone Sacramentary, a sacramentary of the Gelasian type written in 780-800. (Bibliothèque nationale de France, Département des Manuscrits, Latin 12048; folio 17r); the feast of St Agnes “de nativitate” begins with the rubric in the sixth line. There are two Collects, the first of which is also said in the Missal and Breviary of St Pius V; the second is the one which refers to “repeating” her feast. What he says in this regard, however, is hardly conclusive. Fifty years later, a canon of St Peter’s Basilica named Benedict, in a treatise now known as the 11th Ordo Romanus, describes the manner of celebrating the days within octaves, specifically mentioning those of Saints John the Baptist, Peter, Lawrence, and the Assumption alongside those of Christmas and Epiphany. (chapter 68) A similar custom is attested in the Ordinal of Pope Innocent III at the beginning of the 13th century. Bäumer radically overstates his case when he attributes the celebration of the days within octaves to the influence of the Franciscans; St Francis was born fifty years after Canon Benedict wrote, and received verbal approval for his order from Innocent III only a few years before the latter’s Ordinal was compiled circa 1213-16. Simply put, it is hard to avoid the conclusion that Bäumer fell into the trap that the liturgical scholars of his era routinely fell into, extrapolating too much from too little evidence. I write above that Bäumer’s was “the most influential” explanation for the Second Feast of St Agnes, because it seems to have been the model for part of the Breviary reform of Pope St Pius X. Prior to this reform, octaves were celebrated with varying degrees of precedence, but not formally divided into classes as feasts were. The reform of 1911 created three classes of octaves, “privileged, common and simple,” the first of which was subdivided into three orders. The simple octaves are those attached to feasts of the second rank (among six), called Doubles of the Second Class; such octaves are celebrated as a Simple feast (the lowest of the six grades) on the eighth day, with no mention of them on the intermediary days. 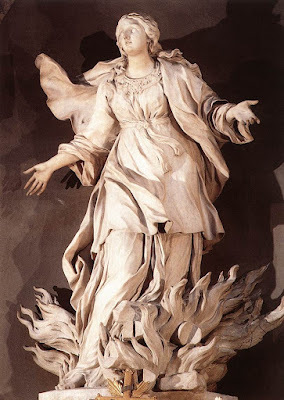 St Agnes on the Pyre, by Ercole Ferrata, 1660-64, in the church of Sant’Agnese in Agone, built at the site of her martyrdom in the Piazza Navona in Rome.